I am wondering why I never thought of this before… chocolate cream puffs. I was looking for a dessert for a Friday night when my kids were around, when I ran across this recipe. Cream puffs have always been one of my favorite desserts. There is just something about the texture of the pastry that I find really yummy. So I can’t imagine why the chocolate lover in me never thought about adding some cocoa to the pastry… I just can’t believe it. I think that chocolate makes everything just a bit better. Don’t you? These pastries are filled with ice cream and then the chocolate sauce is drizzled over top. The original recipe called for filling these with chocolate ice cream. Well I don’t think that there is nothing wrong with that, but I decided to step out of the box and go with something just a bit different. I went with the mint chocolate chip and I do have to say it was perfect. 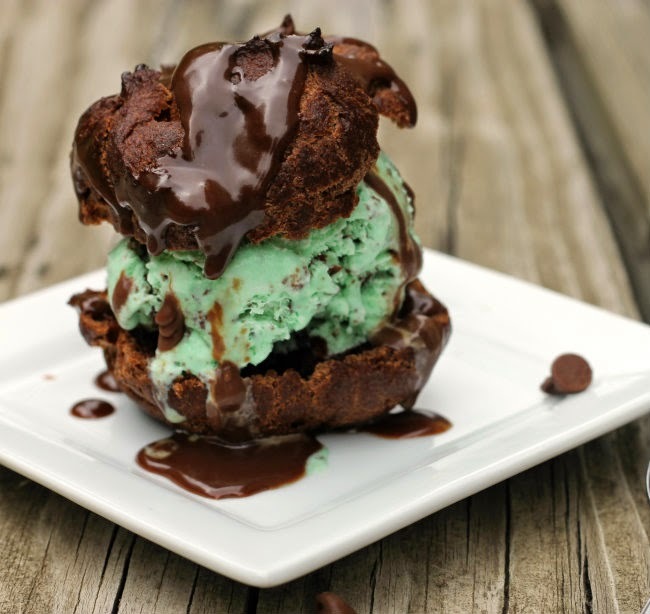 Plus I love the color of the mint chocolate chip in this dessert. Looking for something special to serve your family or friends… chocolate cream puffs will definitely do just that. 1. Preheat oven to 400 degrees F. Lightly greased to baking sheets. 2. In a large saucepan, combine water, 6 tablespoons butter, and 1 tablespoon sugar. Heat over medium until just boiling. Remove from heat and add the flour, stirring vigorously until a ball forms. Add the eggs, one at time, beating well after each egg, until the batter is smooth. 3. Drop the batter by rounded tablespoons, 2 inches apart on the prepared baking sheets. Bake for 30 minutes, remove from oven, and cool completely on a cooling rack. 4. In a medium sauce pan combine the milk chocolate chips, cream, corn syrup, and salt. Cook over medium low heat stirring constantly. Continue to cook until the chocolate chips are melted and the chocolate has thickened. 5. Remove from heat and stir in vanilla. 6. To assemble, with a serrated knife cut the cream puff in half. 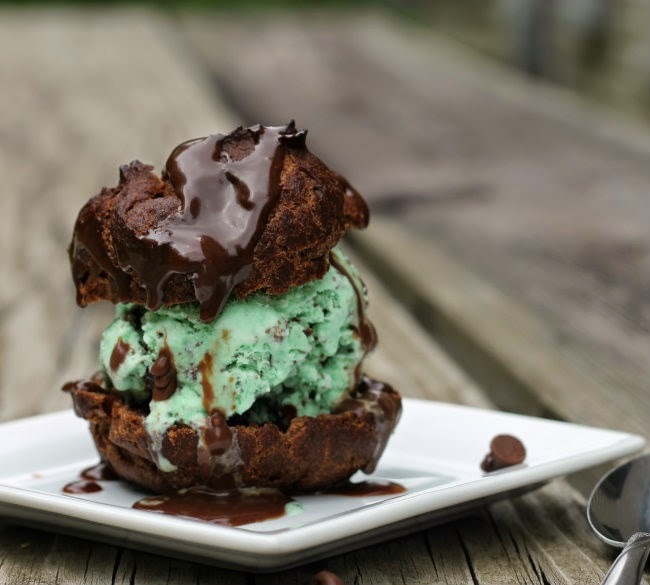 Take a scoop of your favorite ice cream and place on the bottom of the pastry. Place the top of the pastry on top of the ice cream. Drizzle with the warm chocolate sauce. Now I’m sitting here wondering why I never thought of that either. These look amazing Dawn! Mint chip is one of my favorite flavors – good choice 🙂 I think the kids I think the kids will enjoy this recipe with cookie dough! These look absolutely heavenly Dawn! 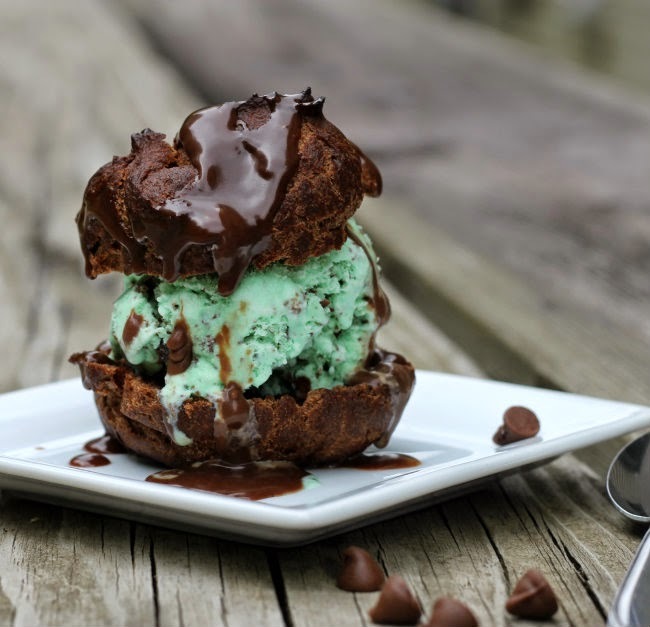 Love the idea of a chocolate cream puff! Ha ha…well I’m glad you did think of it as these look amazing! Where can I go and get these ingredients right now!! !